26 posts for the 26 letters of the alphabet. Today's post is brought to you by the letter 'L'. When I get to Z, I will draw the REread prize pack. To win it click here and get social. L is for loopy, inspired by my nut-bag of a dog, Sybil. Today we took said nut-bag for a special treat, a ride in the ute and a swim. One is happiest (when one is a dog) when flying along at 80km and hour with your nose in the wind and lunging at buses, trucks, larger utes and motorcycles. There was a lot of stick throwing, dog paddling and shaking water all over stick throwers. After the retriever impersonation we drove to Dayboro for a quiet beer at the pub, news to us it was 'Dayboro Day'. 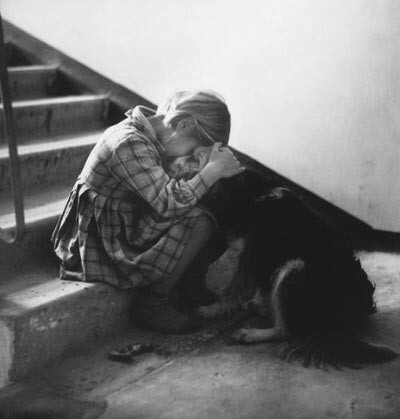 Sybil was a little overwhelmed at first by the thousands of people, but once that wore off she was back to her 'worst behaved dog in the world' self. A small piece of Dagwood Dog was used to lure her through the crowd without any casualties. Loopy dog is now tired and asleep in a little ball in the kitchen. 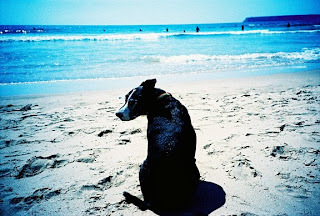 A more sensible looking beach dog ... A Lomo photo from here. No point in being a 'sensible' beach dog if you ask me. Especially when there are such glorious alternatives. Sybil is so adorable! Hope you enjoyed the Memorial Day weekend!